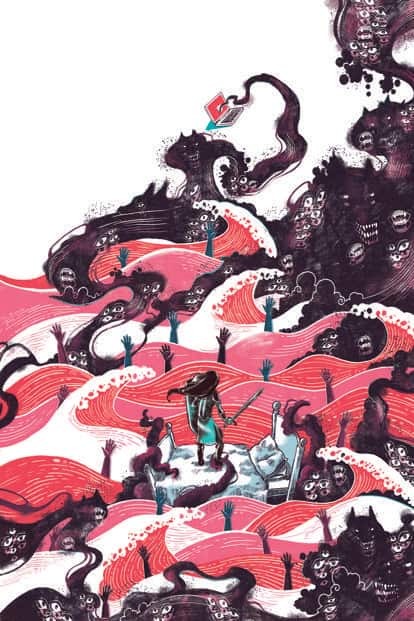 Mumbai-based illustrator Pia Alizé Hazarika responds to the #MeToo movement: The untitled piece looks at the important role social media played during the movement, both in terms of being a platform for women’s voices and as a battleground where they faced abuse and trauma for sharing their stories. “Women were standing up and fighting, sure, but the amount of backlash they faced was ridiculous," says Hazarika, who was one of the people coordinating legal aid and counselling for survivors who shared their stories on Twitter. “Women on the ‘frontlines’ were facing verbal and mental abuse, they got hacked, they got doxxed, they had to live and relive painful personal experiences. It was hard keeping your head above water." The illustration plays with the idea of “monsters under your bed" to represent the old traumas that had to be dredged up for a lot of women in the movement’s wake, and the emotional toll it took on them as well as their male allies. “At the same time, there was a lot of new trauma," she says. “For every woman that came forward, there were three who were too scared to. Voices were lost, stories went untold—it was like an unrelenting storm." Hazarika, whose work is primarily focused around social causes such as mental health and gender equality, believes that while #MeToo has had an undeniable effect, it’s imperative that the movement does not lose momentum and manifests itself outside of the digital space. “I think what’s been accomplished so far is amazing, but honestly I’m still a little sceptical," she says about the movement’s potential for transformative change.